Jim Crace’s novel, “Quarantine,” centers around a 40-day fast in the desert. But this is not just any fast — it is the time when Jesus heads off for his 40 days of fasting, culminating in his resisting of the temptations. But Crace is not writing a religious novel in the Christian sense. Instead, we see Jesus as one of group of both intentional and unintentional pilgrims. We have Musa, a bullying trader who is on the verge of death when Jesus appears and places a drop of water on his lips. Instead, of dying, he comes fully back to life, much to the dismay of his pregnant wife, Miri, who is off digging Musa’s grave when Jesus shows up. Musa and Miri had been left behind by their caravan, but now stay so Musa can make money off of three other pilgrims: Shim, a young, ascetic want-to-be; Marta, who wants to become pregnant before her husband throws her out; Aphas, and elderly Jew seeking a cure for his cancer, and an agile peasant who is unable to speak. Jesus is not the center of the novel or the group. He traveled apart from the group, and chooses a cave separate from the others. His only direct interaction with them comes toward the end of the novel. As we watch the others as they progress through their 40-day fast, which is broken an sundown, we also see Jesus, refusing any subsistence. His prayers become part of his body and breathing, while at times he struggles with madness. He strips off all his clothes, sees the offers of food from the others as a temptation, and dreams of glory even when he knows he should not. This is not a Jesus of miracles, but a young man wrestling with God’s intentions for his life. Crace sounds like the novelist, Nikos Kazantzakis, in his earthly portrayal of Jesus. But Kazantzakis clearly sees the divinity of Jesus, while Crace does not take that step. Instead, it is up to the reader to impart their own beliefs on the struggles of Christ. Crace leaves the reader options to do so, even right to the end. But Crace will not be seen as supporting the divinity of his creation. rer. While some can see Jesus’ loss of rational thought in the book as a sign of disrespect, the fact is that the Christian faith calls for a fierce irrationality which can look foolish to others. 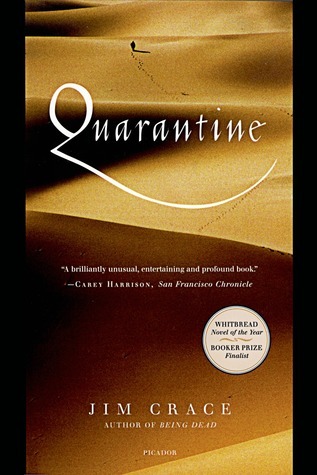 In addition to the controversy, “Quarantine” has also won both praise (NY Times Notable Book)and prizes (Whitbread Novel of the Year and Booker Prize finalist). I question if it would have done so without the insertion of Jesus as a character, although most of the novel does not involve him. At times the story seems as lost as its characters, although it always finds its way back to the center. The 1997 novel has also been adapted for stage. You can learn more about Jim Crace and his work at his website.